Istralandia is a water park in the municipality of Brtonigla, Croatia, about 5 km from the Adriatic Sea. Relatively new, the water park was opened to the public in 2014, making it the first water park in Croatia. 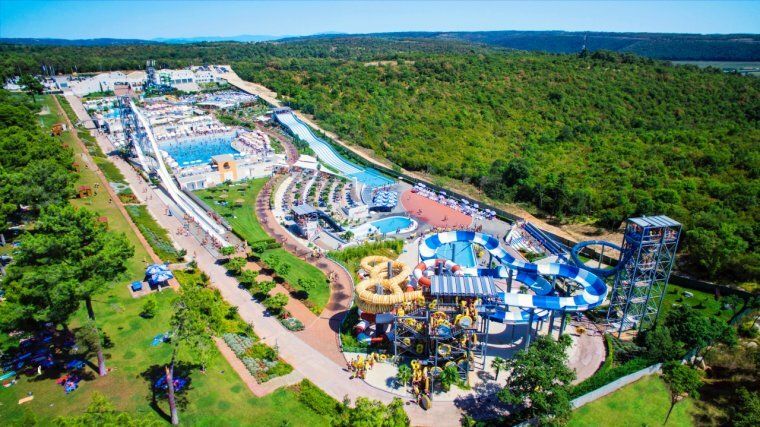 Although only 5 years old, this water park has already made a name for itself and should not be missing on any visit to the Adriatic. The water park has a considerable size of 81,000 m2. The wave pool alone is 2,500 m2. There are also 20 slides. Istralandia is the largest water park in the Mediterranean and has been awarded with a special prize as the best amusement park. Particularly noteworthy are the waterslides in Istralandia. Over 4,500 m2 of water surface are some of the best water slides scattered. Among other things you will find here a 27-meter-high free fall slide, the Fantasy Hole slide and for the family the rafting slide. Among more than 300 water parks in Europe Istralandia reached fifth place for its entertainment offer for young and old. Aqua Colors water park is located near Poreč, a popular summer resort, only 2 km from the sea. If you do not want to walk to the water park or ride a bike, there is also a simple bus service that will take you from Porec directly to the water park. Of course you can also use your own car. Wave baths and much more. Something not every water park offers, Aqua Colors is baby friendly. Here you will find changing tables and relaxation areas where you can spend time with your youngest. For the older children there are attractions and refreshments. Among other things, there is a water slide for babies of one year. Safety, cleanliness and comfort are what make this waterpark so special. To make sure you feel safe with Aqua Color at all times, the water park has lifeguards at every pool and every attraction that is responsible for the safe flow. If somebody really gets hurt, there is a first aid room with a registered nurse. All washrooms, changing rooms and showers are kept constantly clean. Cleanliness is a high principle of water park entrepreneurs. Sun loungers and parasols can be borrowed for free at any time. The entrance fee is staggered in five different categories. This gives every visitor the opportunity to buy exactly the package for their needs. No one pays more than he really needs. Solaris Dalmatia Aqua Park is the first theme park in Croatia. It is located in the middle of the Amadria Park Šibenik, a popular family area. Next to it is the Kinder Hotel Andrija and the Family Hotel Jakov. The children's zone alone covers 800 m2. No doubt, here young and old will find many adventures. You could spend the whole day participating in activities or going from one attraction to another. Particularly popular is the "Lazy River" and the big food in Regensburg. There are plenty of water effects, such as glands, slides, sprinklers and waterfalls. Every single effect promises a new adventure. All visitors are always monitored by lifeguards. The Solaris Dalmatia Aqua Park has a capacity for 1,000 visitors. The barrel at the highest point of the water park is poured onto the visitors every 13 minutes, to the delight of all spectators! The children's area was equipped with themes and many colors that appeal especially to children. To emphasize here is the fairy tale cave. A fantastic, colorful world for children. A day pass gives you access to sun loungers, the full water adventure, umbrellas, showers and a wardrobe. The "Splash offer" includes food and drinks. A must is the homemade ice cream. The entrance fee starts at 6.50Euro with a maximum price of 14.70. The Solaris Dalmatia Aqua Park is one of the best white water adventures on the Adriatic. The Amadria Park Šibenik itself is known for its 5 thematic beaches, surrounded by beautiful Mediterranean vegetation. Here you will also find the best resorts in different sizes and with outdoor pool. In addition, the park offers attractions, restaurants with excellent cuisine, souvenir shops, beach clubs and bars. An unforgettable holiday is guaranteed. A day at Aqua Park Čikat is an experience for the whole family. The water park is located only two kilometers from the center of Mali Lošinj, in a campsite surrounded by dense pine forest. The total area spans 6300m2. Of these, 2400m2 are dedicated to a variety of pools. The water park is designed to provide entertainment and relaxation for the entire family. The special feature of the Aqua Park Čikat is that all pool facilities are exclusively filled with seawater. You will enjoy the ambience of the beach with the comfort of a pool. The Aqua Park Čikat has 5 different pools. They are all different in size and depth. Yes, even the smallest family members were thought here. Always popular with children is the moated castle in the form of a sailing ship. There are also various nozzles and fountains, slides and ramps. All features are equipped with the highest security. If you do not want to actively participate in the water, you can enjoy the numerous water attractions. Not everyone is a water rat! All pool facilities are adapted to the needs of people with disabilities and are supervised by lifeguards. Pre-season and low season: (14.05 to 23.06 and 16.09 to 30.09), from 11am to 7pm. High season: high season (24.06.-26.08.) From 10 to 20 o'clock. Admission to Aqua Park Čikat is free for visitors. Low season: about 10 euros.